You know how much I love to visit Pastry Studio. One fantastic recipe after another. This particular one doesn't need to be for the holidays, but as it turns out, I've offered to bring a cookie tray to our Garden Club Christmas party. I think it's a super idea that we each bring food to this event and then pay a small sum for drinks. Another holiday party I usually attend is my Antique Club's annual celebration. This year, they are charging $60 per person! Yes, it's being catered and this includes food and drink, but don't you agree that's a little over the top? I'm skipping that one, much as I love the women in that group. So I've been having fun making all sorts of new cookies the past month for the Garden Club do. These "sparklers" don't have a deep, dark chocolate flavor like a lot of Christmas cookies, but are elegant and subdued. They'll be a super addition to the cookie tray and the raw sugar on the outside adds that all important sparkle. I think you'll find them more in the Christmas cookie spirit by dipping them in red sugar. I make them that way often. Sift the flour, cocoa powder, cinnamon and salt together. Beat the butter on medium speed to soften. Gradually add sugar and continue mixing, until the mixture is smooth and creamy, but not airy. Add vanilla. Scrape down the sides of the bowl as you go to ensure thorough mixing. Turn down the speed to low and add the flour mixture, mixing just until ingredients are just about blended. Remove the bowl from the mixer and finish mixing with a rubber spatula to avoid overmixing. Divide the dough in half and shape each half into a log about 1 1/2” thick and 7 1/2” long. Wrap the logs in plastic and chill for 1 to 2 hours. Preheat the oven to 350 degrees. Line two baking sheets with parchment paper or silpats. Whisk the egg yolk with one teaspoon of water. Place a piece of parchment or wax paper on a work surface. Spread out a good handful of raw sugar on it. Working with one cookie log at a time, unwrap and brush lightly with egg wash. Roll each log in the sugar, pressing gently. Use a sharp thin knife to slice each log into cookies about 1/2” thick. Bake for 15 - 18 minutes, rotating the pans front to back and top to bottom at the midway mark, until the cookies are just firm to the touch. Transfer to wire racks and cool completely. Repeat with second log. Aha! You probably thought this cake was going to use fresh plums. So did I when I first saw the title. But surprise...it uses plum jam. And it's yet another seasonal cake with lovely fall flavors. It was created by Bill Yosses as the cake version of Sticky Toffee Pudding, a British favorite. I wish you could have smelled this while baking....warm spices wafting through the house. The cake calls for some tart dried cranberries and the plum jam melts into sticky pockets while baking; the walnuts add a lovely crunch. In a large bowl, combine the flour, baking powder, baking soda, nutmeg, allspice, cinnamon and salt. In your mixer, beat the eggs and sugar until combined. Add the canola oil. Slowly beat in the flour mixture. Stir in the buttermilk. With a spatula fold in the cranberries and walnuts. Swirl in the jam in three to four strokes. (This is important because you want the cake to have sticky pockets of jam.) Pour into the loaf pan and bake for 50 minutes or until a cake testor comes out clean. Allow to cool in the pan for 25 minutes, then turn it out onto a rack. Allow to cool for 5 minutes or so, then serve warm. This cake lasts a week well covered. 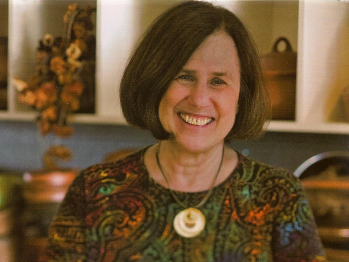 Would you believe, when she was first married, Paula Wolfert couldn't boil water? Determined to change, she decided to take cooking classes at Dione Lucas's Cordon Bleu and found her calling. In 1959, Paula moved to Morocco for 10 years with her husband. While there, she became fascinated with the local dishes and Mediterranean ingredients. As a result, she has written several cookbooks on the subject of Mediterranean cuisine. She moved to Tangier in 1971 and stayed for five years, during which time she wrote Couscous and Other Good Food from Morocco (1973) and Mediterranean Cooking (1976). Both books were enthusiastically received by curious cooks who were searching for unfamiliar ethnic fare. Ms. Wolfert was criticized for using hard to find ingredients, but remained adamant about using them. "Ingredients from a given region have amalgamated gracefully over the years, and if you change them, you simply won't get an authentic taste," she says. "When people return from their travels they want to replicate what they have tasted. It is my job, as a food writer, to explain how to integrate unusual tastes. Most of the ingredients are now readily available, at least by mail order. But you have to be romanced into searching them out. That's part of the fun." More recently Wolfert has been addressing concerns about the benefits of a balanced, healthful diet. When meat is used, Wolfert has a lot of tricks to maximize its flavor while cutting fat. Then, when Wolfert traveled across the Euphrates, she came back with a new daily routine that gets her eating vegetables in the morning in what she calls her Biblical Breakfast Burrito. As a result of healthier eating, she's lost over 30 pounds, slowly---a pound a month over the past couple of years. Paula Wolfert has won the Julia Child Award (twice), the James Beard Award (three times) the Tastemaker Award, the M. F. K. Fisher Prize, the Cooks Magazine Platinum Plate Award, and the Perigueux Award for Lifetime Achievement. A regular columnist for Food & Wine, Wolfert lives in Sonoma, California. Cut a rustic style bread with a serrated knife into ½-inch slices. Lightly toast the slices on a grill or in a toaster-oven on both sides. Slather the toasted slices with freshly crushed ripe tomatoes. The layer must not be too thin—or too thick—more like a thin, even red sheen. Sprinkle with fine salt. Slowly drizzle a light, golden extra-virgin olive oil on top on one side. If you like, you can top the bread off with paper-thin slices of Serrano ham or large, fat fillets of anchovy, preferably imported from l’Escale. You may want to rub some garlic on the bread as well, but I’ve yet to meet a Catalan gastronome who would approve. Eat with a knife and fork." Does everyone love a boozy ice cream as much as I do? Especially around the holidays. Now I know Ms. Wolfert is best known for her Mediterranean cooking, but don't forget she also wrote "The Cooking of Southwest France". And in that gem this recipe for Prune and Armagnac Ice Cream is to be found. The prunes have to macerate in Armagnac for a couple weeks in advance, but the wait is worth it. I just kept the jar in the fridge for two weeks and when I opened it to make the ice cream, I took a sniff and was in heaven. My spoon was in that ice cream maker frequently...tasting....tasting. I could barely wait for it to be done. Serving it with extra prunes was suggested, but frankly, in this case, less is more. Soak the prunes in the tea overnight so that they swell up. The following day, drain the prunes, discarding the tea. Roll each prune in paper towels to dry well. Place them in a sterilized 1 1/2 -quart wide-mouth canning jar. Make a syrup with the sugar and one-half cup water; bring to a boil, stirring. Boil undisturbed for 2 minutes. Remove from the heat and allow to cool. Pour the syrup over the prunes. Completely cover the prunes with Armagnac; stir. If the prunes rise above the line of liquid, add more Armagnac. Let the prunes soak a minimum of 2 weeks in a cool, dark place or in the refrigerator. Use clean wooden tongs or a wooden spoon to remove the prunes as needed (keeps up to one year). A day before serving, in a heavy enameled saucepan, scald the milk with the vanilla bean; set aside, covered, to keep warm. In a mixing bowl, beat the egg yolks and sugar together until thick and pale and a ribbon forms when the whisk is lifted. Whisk in a pinch of salt. In a heavy enameled or stainless steel saucepan, warm the beaten eggs and sugar over very low heat, stirring constantly. Gradually stir in the hot milk. Cook over low heat, stirring constantly with a wooden spoon, until the custard thickens enough to coat the back of the spoon, the froth on the surface has disappeared, and the custard registers about 165 degrees on a candy thermometer. Do not boil. Immediately remove from the heat. Strain the custard into a chilled mixing bowl set over ice. Cool down quickly, stirring constantly. If using vanilla extract, stir it in at this point. Pour into an ice cream maker and freeze according to the manufacturer's instructions. Meanwhile, coarsely chop the prunes with a large sharp knife or by pulsing in a food processor. 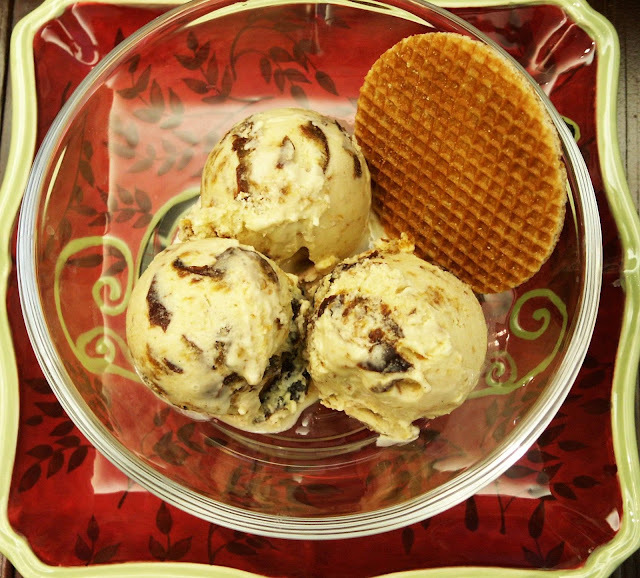 When the ice cream is half frozen, add the prunes and the Armagnac syrup. When almost frozen, add the cream. When the ice cream is done, transfer it to an airtight container and set in the freezer overnight. To serve, place a whole, soaked prune on top of each portion and drizzle with a teaspoon or so of the syrup. Please contact me at bsmithw@gmail.com and give me your mailing addresses. My second cookie for this holiday season is a lovely ribbon cookie. Fairly easy to make, pretty to look at and delicious to eat. 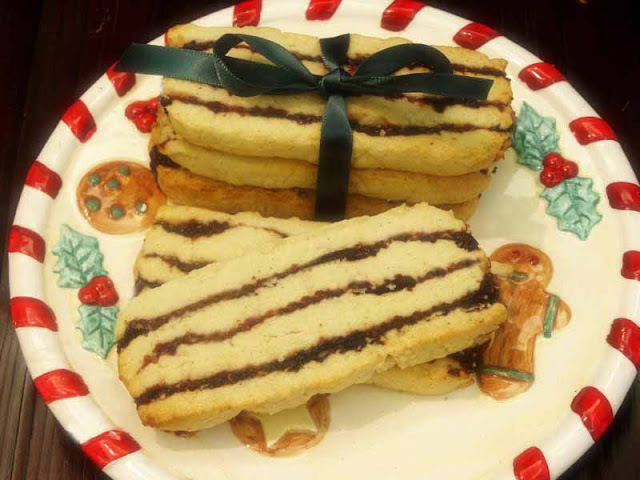 The layers of a vanilla almond shortbread-like dough sandwiched in between the tangy cranberry and cherry filling makes this cookie a perfect foil to the holiday chocolate and spice cookies on your tea tray. They keep beautifully in your cookie jar, if indeed they don't disappear in a day! And they make super hostess gifts too. This was my first time making these ribbon cookies but I'll be making them a few more times this season. Bench notes: next time I'll trim them better so the corners look neater (I hated wasting the dough by trimming too much) and because it's such a large cookie, I'll cut the dough slices in half before baking. If you do that, keep your eye on the cooking time. I'll also try to get the cranberry-cherry layer more even. Practice makes perfect, so take advantage of my mistakes! Combine the cranberries, cherry preserves, and sugar in a food processor. Process until coarsely pureed. Transfer the mixture to a medium saucepan and cook over medium heat, stirring to avoid burning, until the mixture comes to a boil. Remove from heat and add almond extract. Cover and refrigerate for an hour. In a mixer, combine the butter and sugar and blend together until smooth and creamy. Add the egg, vanilla, and almond extract and beat until combined. Add the flour mixture and beat just until incorporated. Let the dough stand for about 10 minutes to let it firm up. Line a 4 1/2 x 8 1/2 inch loaf pan with foil, letting the foil overhang the long sides so you can easily remove the dough from the pan. On top of the foil, line the pan with two sheets of plastic wrap laid crosswise and overhanging the longer sides as well. Divide the dough into quarters. Shape one portion into roughly the size of the loaf pan ( pre-shaping each layer is an important step and will make it easier to layer the cookie) and pat into the bottom. It may even help to have a dough tamper to get the dough in evenly. Spread one-third of the cranberry filling over the dough with a small spatula. Repeat with the remaining three portions of dough and two portions of filling. Fold the plastic wrap over the dough, completely covering it. Freeze the dough in the pan for at least 1 1/2 hours, until firm. Preheat the oven to 350 degrees. Line several baking sheets with baking paper. Take the loaf out of the freezer and unwrap the dough. 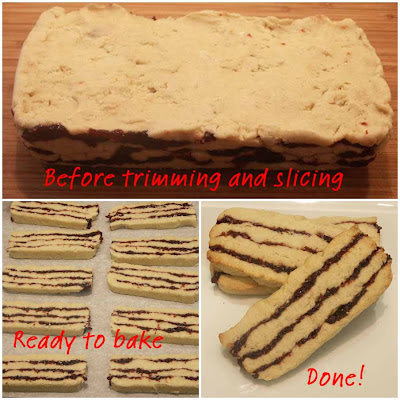 You can allow it to warm up a bit for a few minutes, but don't let it get too soft or it will be difficult to cut neat slices and the filling will start squishing out. Using a sharp knife, trim the sides so that the sides of the loaf are straight up and down. Wipe the knife off between cuts. Cut the loaf into thirds on its long side. 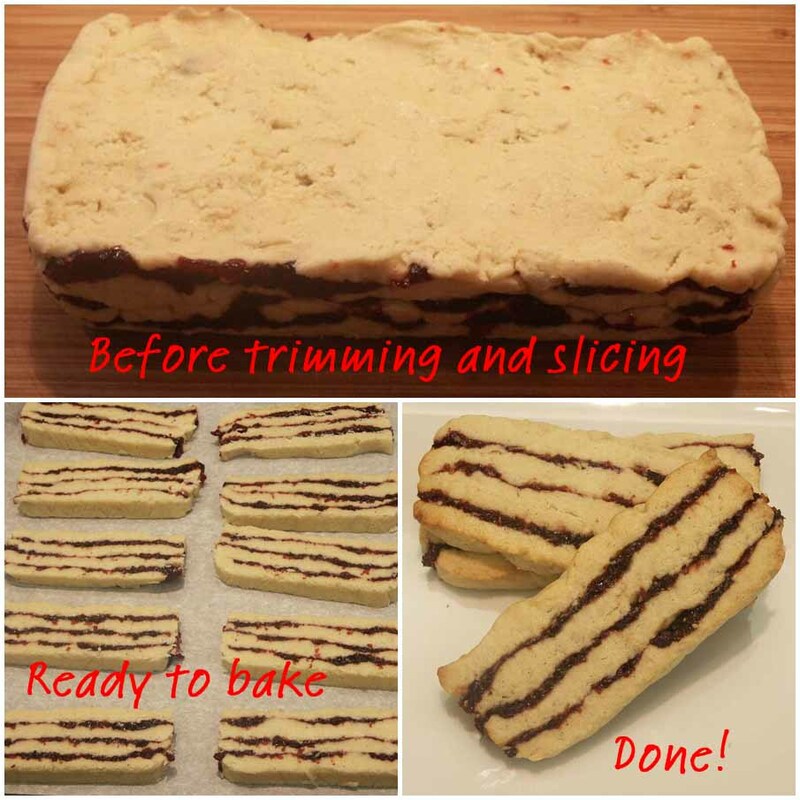 Cut each third into 1/4 inch slices that are about 2 3/4 inches long. Transfer the slices carefully to the baking sheets, placing them about 2 inches apart. Bake one sheet at a time for about 9 to 14 minutes, until the edges are just starting to darken and firm up. Transfer the cookies to wire racks and let them cool completely. 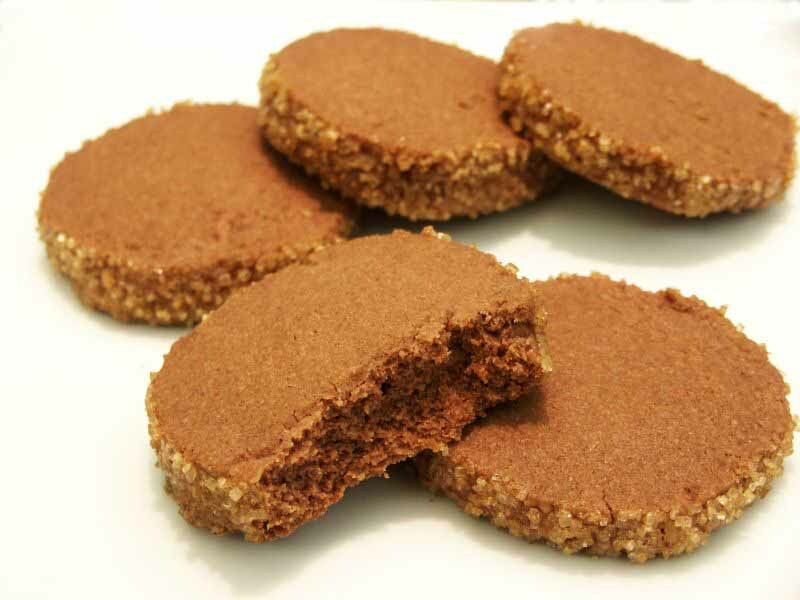 Store cookies between layers of parchment paper in an airtight container for up to 1 week. It's hard to believe someone as successful as Paula Deen suffered from panic attacks and agoraphobia when she was younger. She's certainly one of the most gregarious personalities on TV. Paula's story is a true American success story. She started out with nothing. After moving to Savannah, her divorce from her first husband in 1989 left her with only $200 and her two teenage sons. But Paula was known as an excellent southern cook and soon began a catering business (called The Bag Lady), with her two sons doing the delivering as she was still afraid of public places. Paula self-published her first cookbook in 1997 which was noticed by a literary agent and she has now published many more, all highly successful. Amazon has pages of them to choose from. Deen's reputation grew and she was signed on the Food Network for a show in 1999, which parlayed into three shows, now taped in her home in Savannah. Her sons appear frequently on her shows and have had a show of their own. Paula appeared on Oprah and told her story which was an inspiration for many. She has also appeared in several movies and won an Emmy for Paula's Home Cooking. Cookbooks, magazines, restaurants, TV shows....you can't get more successful than that! She did good. Now this recipe is definitely NOT a celebration of the coming holidays, but if I'm going to represent this game changer typically, here's what I say: Southern + Fried = Paula Deen. Save the recipe for next summer! Slice the tomatoes 1/4-inch thick. Lay them out on some paper towels and sprinkle with salt. Allow time for salt to pull the water out of the tomatoes, approximately 30 minutes. In a medium nonstick skillet, pour the oil to a depth of 1/4-inch, add the bacon renderings and melt over medium heat. In a small bowl, combine the cornmeal, flour and House Seasoning. Dip both sides of each tomato slice in the flour mixture. Add the tomatoes to the hot oil and cook until golden brown, 3 to 4 minutes per side. Last chance to check out my Christmas apron giveaway HERE. I'll be drawing the 4 winners on the 20th. What can I say? Ina is the best. And of course, these sides are divine. They went perfectly with our roasted turkey roulade and gravy last year. Even if you don't make these with your turkey, be sure to try these lovely potatoes sometime soon. I'm seeing them everywhere online. There's nothing simpler, it makes a super presentation and who doesn't love a crunchy potato? Or as Ina puts it: "How easy is that?" Bake the potatoes for 30 minutes, until they are tender and golden and crisp on top. This is the end of my recipes from last year's Thanksgiving. Aside from a couple old favorites, I tried all new dishes. A lot of people don't care for rutabega. I love it. It's also known as a yellow turnip. It's got a waxy outside, so you peel it and inside is a hard orange/gold vegetable which you can roast, boil, mash, whatever. My mother served it to us a lot when I was a child so we grew up loving it. Oddly, I don't remember serving it to my kids very often, but they really enjoyed this side dish last Thanksgiving. Peel the rutabegas to remove the waxy skins and cut them into generous 1-inch chunks. Place them in a saucepan with water to cover and 1 teaspoon of salt. Bring to a boil and simmer, covered, until easily pierced by a paring knife, about 35 minutes. Drain. Puree the rutabega in several batches in a food processor fitted with the steel blade. With the motor running, add the melted butter and milk in a steady stream. The turnips should be smooth. Check out my Christmas apron giveaway HERE. This was such a super find! Don't you love recipes like this during the busy holidays? Ridiculously simple and quick to make, unusual and with a delicious fall flavor. Our Best Bites suggested it for Halloween and put it into hollowed out baby pumpkins. They made some adorable little Halloween cookies to serve with it too. You can check it out at the link. A bit late for that (although I'm going to remember it for next year), but you could use it when you need to take a dessert someplace or when friends and family come over during the holidays. You're going to love this and good luck keeping everyone's fingers and spoons out of this when it's in the fridge. Beat cream cheese, brown sugar, vanilla, cinnamon and nutmeg until smooth. Stir in toffee bits. Place in a serving bowl and serve with Granny Smith apples or fruit of your choice. This can also be pre-made and placed back in the refrigerator, it will not stiffen up. Ms. Silverton, who admits she wasn't much of a student, dropped out of Sonoma State in her senior year. After studying at Cordon Bleu in London, she went to work at Michael’s in Santa Monica, in 1979. There she was inspired by Jimmy Brinkley, their pastry chef. “Unlike when I studied at Cordon Bleu and they said don’t be creative, Jimmy was a wild man, tasting, changing, and I saw how much flexibility there was in desserts,” she said. She learned fast. When Spago opened in 1982, Wolfgang Puck hired her as head pastry chef, but in the back of her mind, Nancy was giving a lot of thought to making great bread. 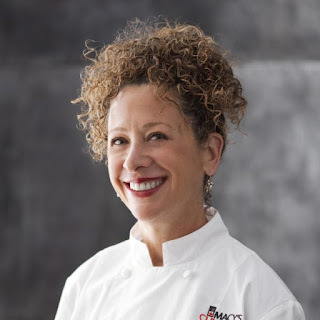 After a brief stint at Maxwell’s Plum in New York, she returned to Spago while she and her then-husband, Mark Peel, were looking for space to open restaurant Campanile. Her mother discovered a great building for lease that was large enough to have a bakery. So La Brea Bakery opened six months before Campanile, in 1989. To study bread baking, Ms. Silverton enrolled at Lenôtre in Paris. “I thought I’d learn some foolproof recipes,” she said. “But I don’t speak French, and I didn’t know about adapting recipes. They were all failures. I had to start from the beginning, a tablespoon of this and a teaspoon of that. It took hundreds of tries.” Nancy immersed herself into starters, yeasts, and doughs, and quickly became L.A.'s leading lady of bread baking. She sold her interest in La Brea in 2001, entrusted it all to an investor and he, in turn, entrusted it all to Bernard Madoff. Nancy remained a consultant and worked at Campanile until 2005. She opened Pizzeria Mozza in 2007 and Osteria Mozza in 2008, before discovering she was broke. Because of Madoff, she lost everything. Fortunately, she still co-owns (with with Mario Batali and Joe Bastianich) those two restaurants, two of Los Angeles’s most popular restaurants. Silverton just published her eighth book, “The Mozza Cookbook” She guest chefs at two local restaurants (Jar and La Terza) for the sheer fun of it. Silverton's bran muffins got rave reviews from David Lebovitz so I couldn't resist trying the recipe. 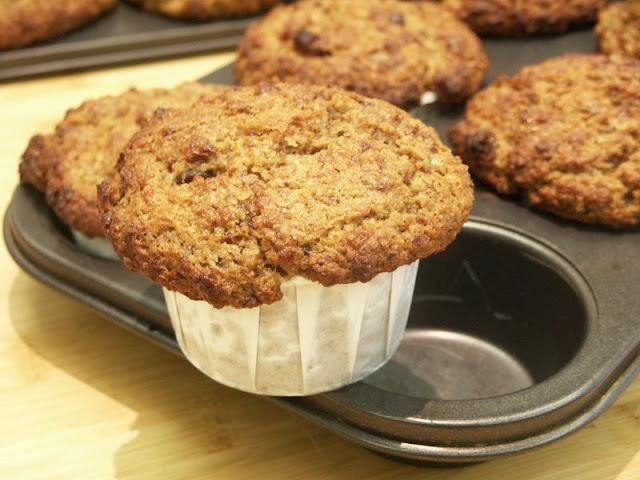 They are very light, full of flavor and not as sweet as most bran muffins. I raised the oven temperature to 375 degrees on the advice of another blogger who had made these. She also suggested mounding the batter into the liners, but as you can see, I filled them too full. Overflowing is good sometimes (love those tops) and these tasty muffins are pretty much guilt-free. Preheat the oven to 350F. Line a 12-cup muffin tin (with 1/2-cup indentations) with paper liners. While the bran is toasting, heat 1 cup (135g) of the raisins with 1/2 cup (120ml) of the water. Simmer for ten minutes, or until the water is all absorbed. Puree the raisins in a food processor or blender until smooth. In a large bowl, mix together the toasted bran, buttermilk or yogurt, 1 cup (250ml) water, then mix in the raisin puree, orange zest, and brown sugar. Stir in the oil, egg and egg white. Mix together the flours, baking powder, baking soda, and salt, and sift directly into the wet ingredients. Stir until the ingredients are just combined, then mix in the remaining 1/2 cup (55g) raisins. Spoon the batter into the muffin tins, making sure the batter is mounded slightly in each one. Because muffin tins can very in size, if your tins are larger, make fewer muffins. Bake for 25 to 30 minutes, or until the muffins feel set in the center. Happy Veterans Day to each of you who have served our country. Thank you for your courage and dedication. And for our freedom. 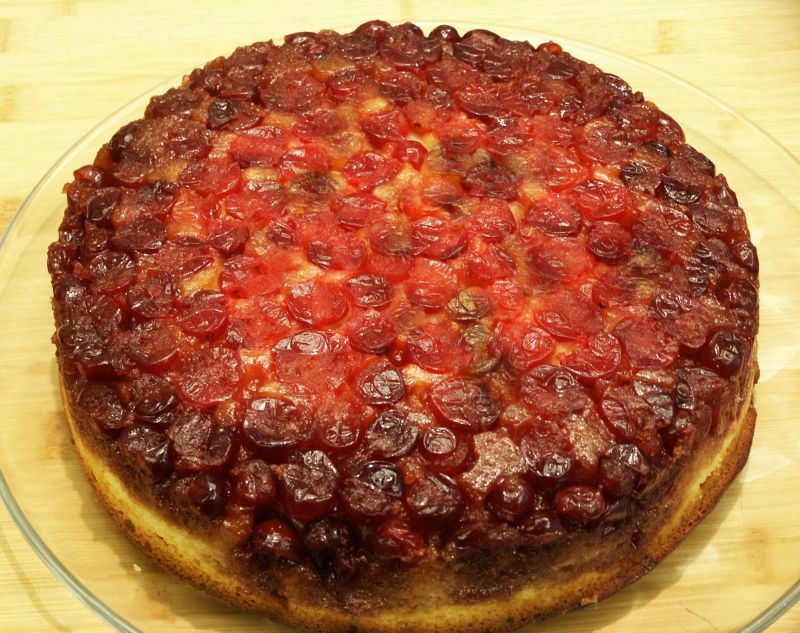 Cranberry-Caramel Upside Down Cake and a Holiday Giveaway! You'll find this such an easy cake to make for the holidays. And the color is amazing. 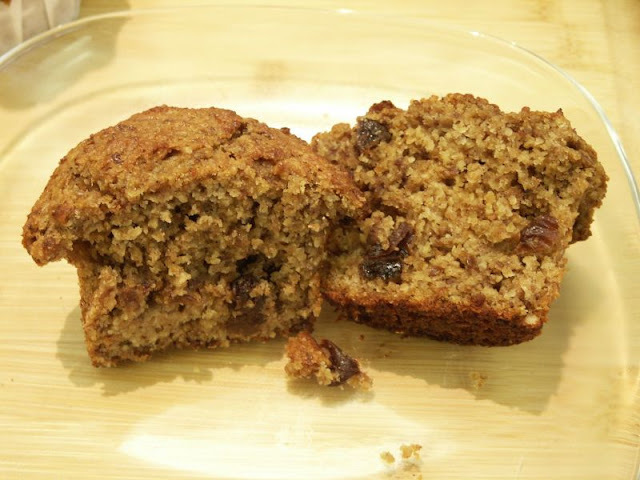 The cake is light and the sweetness of the brown sugar offsets the tartness of the cranberries. The only suggestion I have is mentioned below in the bench note. The photo of the cake in the cookbook shows juice running down the sides. Very pretty. As you can see, mine didn't do that and it was because I took the cookbook's word for the pan size. Wrong. But still, it tasted wonderful even if my oven was a mess! Bench note: The minute I added the batter to the cranberries, I suspected a normal cake pan would not be deep enough, so I put some foil under the pan to catch any overflow. Unfortunately, it still spilled over. My suggestion is to use a deeper than normal cake pan. That way, the juices will remain in the bottom and when you turn it out, they will run down the sides of the cake and not all over your oven. Preheat oven to 375. Grease a 9" cake pan with butter and cover the bottom with parchment paper, cut to size. In a saucepan, combine the brown sugar, molasses, 4 tablespoons of the melted butter and 1/4 cup water. Bring to a boil, stir and pour into the cake pan. Sift the flour, sugar, baking powder and salt and set aside. Beat the eggs and sour cream until well blended. Add the remaining butter and mix, scraping down the sides. Add the flour mixture and beat until smooth. Add the cranberries to the cake pan, making certain they are evenly distributed and cover the syrup with no gaps. Pour the batter over the cranberries, smooth out with a spatula and bake for 45 minutes. Let cool in the pan for 15, then run a thin knife around the edges and invert the pan onto a serving dish. Now for the Holiday Giveaway! I'll pick four winners and each winner will get three aprons. They are in excellent condition, but the taffeta one has a slight pull, barely noticeable. They are vintage, after all. So leave me a comment and if you want a second chance to win, become a follower. I'll draw the names on November 20th.